A Chinese trader waits for customers at her stall selling wholesale signs at the Yiwu International Trade City, in Yiwu, September 19, 2015. Considered the largest small-commodity market in the world, the 46-million-square-foot facility houses more than 60 thousand vendors and 100,000 suppliers selling 400,000 products. Renowned as a trading town during the Qing dynasty, the eastern city of Yiwu again became famous for its markets after China’s economic reforms kicked in during the 1980s. Since then, the metropolis of 1.2 million people has transformed into a hub of the nation’s supply chains, attracting merchants from around the globe searching for cheap Christmas decorations, lighters, pens, and millions of other trinkets. 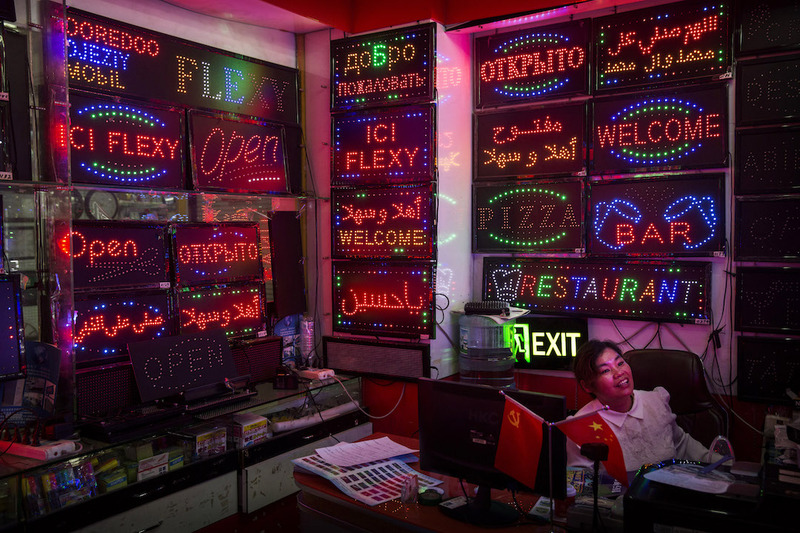 In this episode of Sinica, Kaiser and David Moser speak with Dan Whelan, director and producer of Bulkland, a film about Yiwu and the people who live and trade in it: British, Australian, and German product sourcers; Yemeni merchants, some of whom have been in the city for 30 years; Russian bar dancers; and the locals who work tirelessly to sell the rich harvest of Chinese-made tchotchkes to the rest of the world. The discussion ranges from China’s economic slowdown to the spectacle of Middle Eastern businessmen slaughtering rams in Yiwu’s streets for the Islamic feast of Eid al-Fitr, which marks the end of Ramadan’s month of daily fasting.